Brain drain is passé. The new mantra is brain gain. 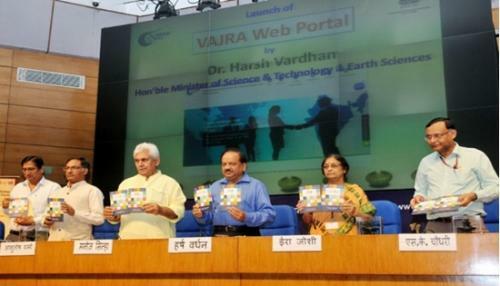 The Ministry of Science and Technology has launched a new scheme to get distinguished scientists from abroad to work in India Called Visiting Advanced Joint Research (VAJRA) Faculty Scheme, it aims to utilise the specialised knowledge and technical skills of overseas scientists, including non-resident Indians (NRIs), people of Indian origin (PIO) and overseas citizen of India (OCI) in the national endeavour. It will seek to promote a globally competitive environment for catalysing cutting edge research for accelerated development of scientific and technological progress and overall economic prosperity of the country. The visiting faculty selected under the scheme would reside in India upto three months in a year and would be provided a lump sum amount of US$ 15,000 in the first month of residence and US 10,000 per month after that. They would have to be physically available for one to three months in the Indian institutions and maintain an adjunct faculty/scientist status round the year. They will have to keep the collaborative laboratory and co-guided Ph.D students in India for the whole term, providing round-the-year mentoring and support to the students and other researchers. At any given point of time, 1,000 adjunct/ visiting faculty positions would be made available under the scheme. 3. By controlling and regulating the migration of our scientists going abroad. In countries like USA the position is becoming increasingly difficult for Indians to get employment or retain the existing position. The time is therefore opportune for bringing back the Indian scientists. It is not as though India could afford to bring back every Indian but at least where there are well defined and relevant national tasks we should attempt to bring the scientists where their talents and training could be matched with the tasks. But before we do that it is good to understand the psychology of our scientists abroad. It is not that the Indians abroad do not want to come back to our country in fact quite a few with a brilliant record have returned with special skills and experience which have been put to good use. But some come back and also left disillusioned. Why is this. They say it is not the lack of comfort or salaries that drive them away but it is the environment lacking in challenging opportunities lacking in the required degree of flexibility freedom, flow of thought that suffocates them. There is also lack of proper system for ready recognition and rewarding of merit. What is called for then is a change in our approach a change in our vertical hierarchical system of management and a change in environment that would permit bringing the best of our men. Council of Scientific and Industrial Research CSIR maintains a Live Register of every scientist abroad with full details of his special skills training etc. This has to be continuously updated. Specific agencies and Indian embassies may keep the Indian scientists abroad acquainted with the latest developments in science in India and also the varied avenues of employment potential. The second question is how to take advantage of our scientis while they are still abroad. The educational technical and research agencies may invite the Indian scientists like any other foreign visitors as Visiting Scientists for short periods and while they are in India they may be treated as guests of the laboratories and local expenses paid for. Indian scientists coming home on leave who are specialists in relevant fields are also welcomed to spend a few weeks or months in an appropriate national laboratory as our guests. In special cases they may be paid for their travel expenses or sponsored under the scientists exchange programme. Similarly the industry may consider inviting technologists and engineers as consultants for short periods. Once the Scientist works as a visiting professor or scientist he develops affinity to local institute keeps in constant touch with it and feeds it with the latest advances in the subject as well as arranges to supply specialty chemicals equipment spare parts etc. In a democratic system control of mobility is not acceptable. Further for a young scientist going abroad means a period of adventure and expending his horizon which in turn, has its own advantages. However in countries like Japan the scientists do go abroad but come back because the conditions at home are made conducive to their quick return. It is here we have to look into. Relationship between human resources and behavior of economies may be moulded by social system and the pattern of education. The pattern of education as obtained in India today is not relevant to the countrys needs.